Britton School/Science Hill Established in 1911 and known as Science Hill. 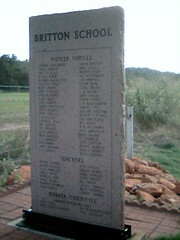 The school house was located one half mile east of this memorial. Later the name was chaged to Britton School in honor of the pioneer family, the church located at the same site served as a Grade School. First school enumeration done in June 1912 reported 18 families in the district designated as #108 of the Gracemont School System. Oscar E Bare was School Clerk. Britton one of the oldest schools in this area when it was closed in1950. Had 24 families all were farmers except for 1 oil field worker, 1 mechanic and 1 day laborer; J.E. Mashaney was School Clerk. 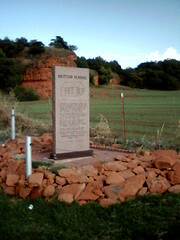 Marker is located directly under Indian Head Rock, Home of Caddo Indian Tribe. Former Residents and Friends gather each September for a School Community Reunion. Binger, OK: Junction 152 and 281/8 go east for 6.3 miles marker is on right side of road. Anadarko, Ok: Junction 62/9 and 281/8 go north on 281/8 for 17.1 miles to Junction 152 and 281/8 turn left on 152 go 1.6 miles marker is on the right side of road. This is the back side of the monument. Listed are the Pioneer Families, School Teachers and Marker Committee. The red rock behind the monument is called Indian Head Rock Home of the Caddo Indian Tribe.